As the launch date of the OnePlus 6 nears, rumors start to get wild, more accurate and more frequent. Now that we have plenty of information regarding the device's specs and overall looks, a CAD designer has created a 3D model of phone that lets us get a better idea of its looks before the official announcement. You can see the small notch on the top of the display (6.2" AMOLED, 2280 x 1080, 19:9 aspect ratio), virtually no side bezels and a small one at the bottom. On the back, we can see the vertically placed dual-camera setup, which is believed to have 20MP+16MP sensors, along with the fingerprint reader. The whole IP67-certified body is expected to be made of glass, while the side frames are reportedly aluminum. 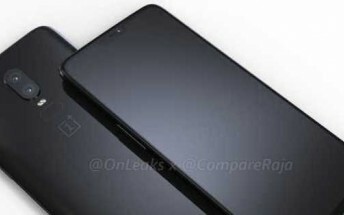 This allows wireless charging, but we are yet to see if OnePlus actually enabled it on the 6. The rest of the specs are a standard flagship affair - Snapdragon 845 SoC, 6 or 8GB of RAM and 128GB or 256GB of UFS storage. A 3,300 mAh battery powers it all, supporting the company's so-called Dash Charge 2.0.